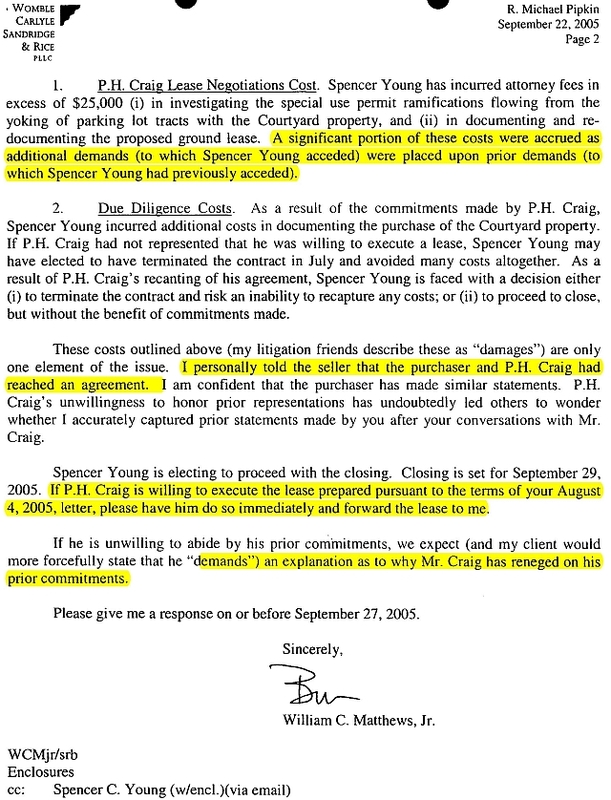 The MorganStanleyGate scandal has included multiple smear campaigns launched against Spencer C. Young: (1) in New York (by CMBS industry word of mouth); and (2) in North Carolina in the form of over 60 false and disparaging newspaper articles appearing over a 15 month period in four local newspapers serving the Triangle Region of North Carolina a (3) national campaign executed by a former Kirkland & Ellis employee turned blogger; and (4) a campaign of targeted smears intended to cause divisiveness among Mr. Young's loved ones that emanated in a series of bizarre anonymous emails that originated out of a farmhouse in Potwin, Kansas during the 2009 Thanksgiving holiday. 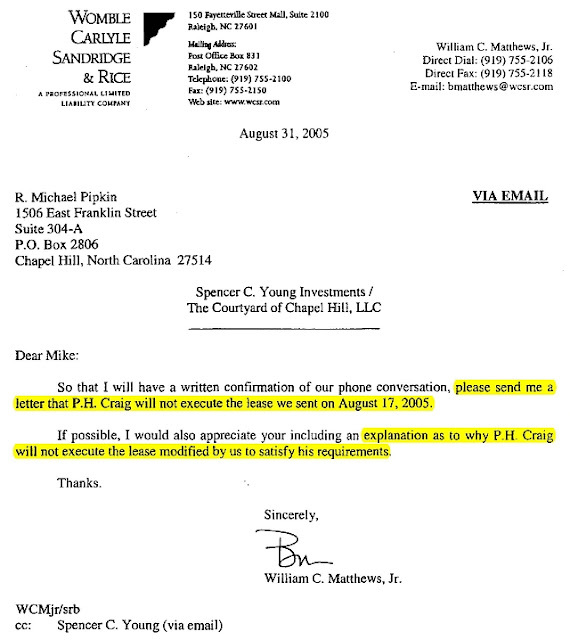 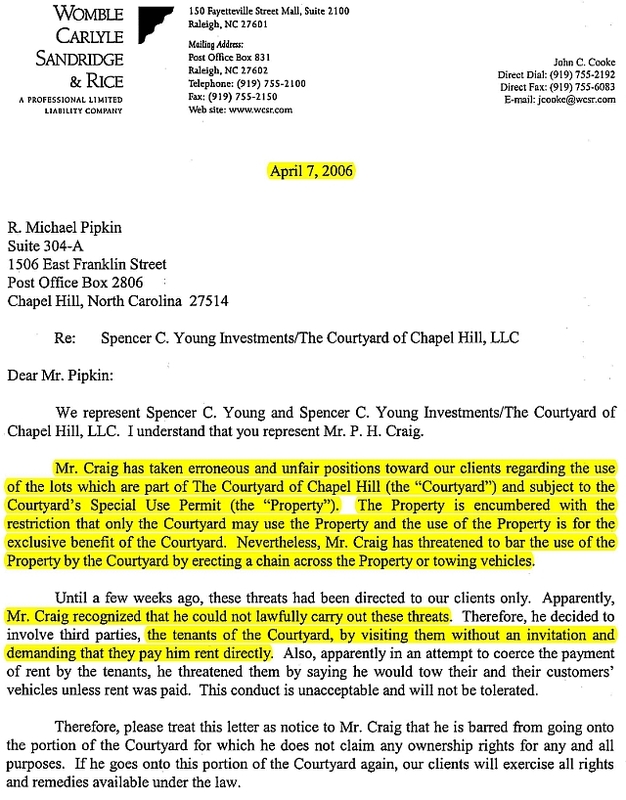 The cornerstone of the North Carolina smear campaign stemmed from a bizarre parking lot blockade which was deliberately structured to be unresolveable and intended to economically destabilize one of Mr. Young's investment properties, The Courtyard of Chapel Hill. 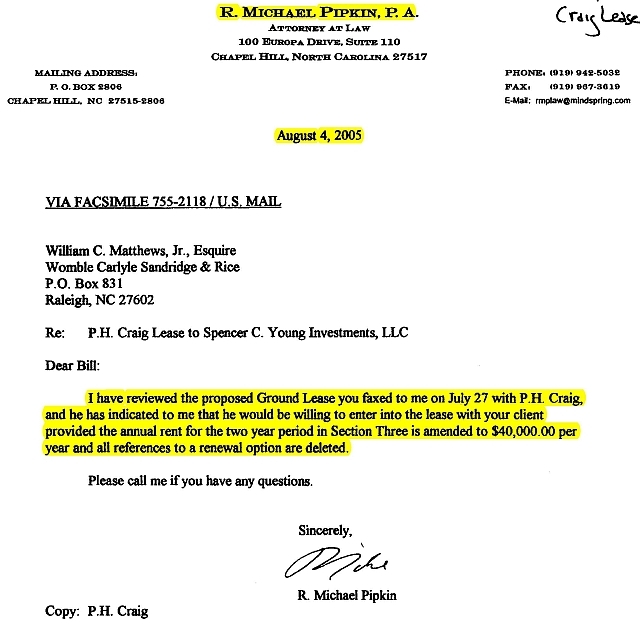 The blockade was erected by a fully encumbered landowner many of the locals referred to as a "cantankerous old coot", who went by the name "PH Craig". 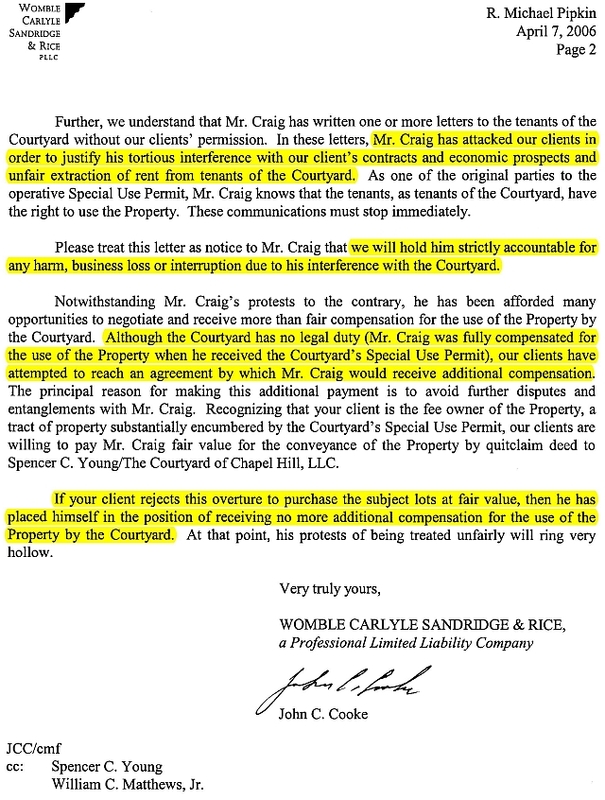 Although Mr. Young had successfully negotiated hundreds of complex contract agreements during his career on Wall St., in PH Craig, he met someone of profound bad faith, the details of which were articulated in letters (reproduced below) by Mr. Young's attorneys at Womble Carlyle. 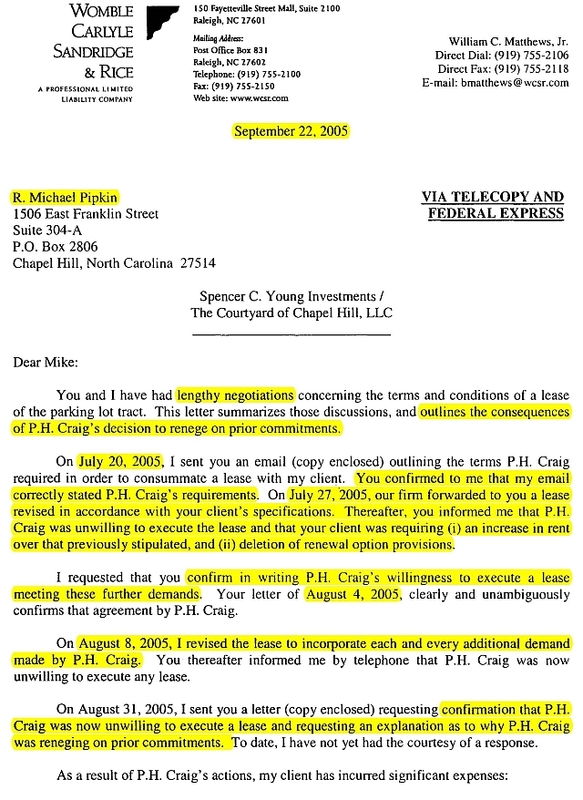 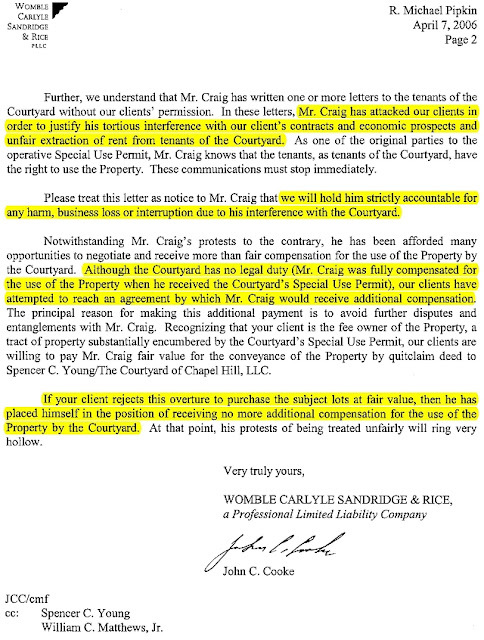 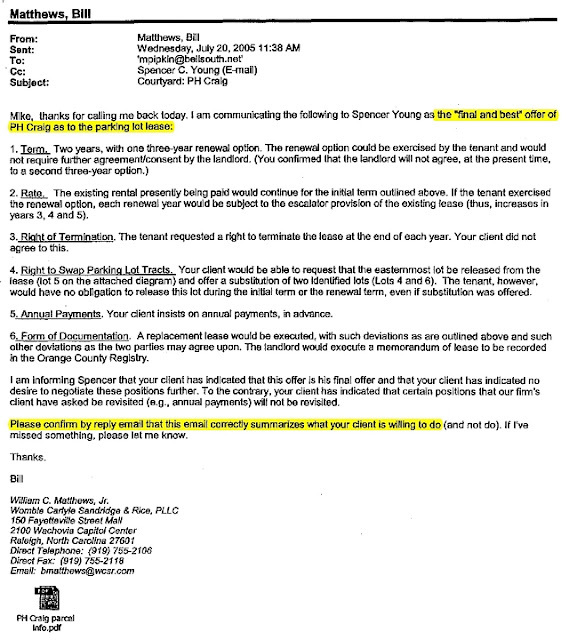 As highlighted in the below correspondence, Mr. Craig chronically reneged on a lease agreement containing terms he specifically requested, such that it became clear that he would NEVER agree to ANY terms. So despite Mr. Young often agreeing to lease terms Mr. Craig offered, in the end Mr. Craig would always renege. Now take a look at the more than 60 preposterous articles written, accessible by clicking here, and note the lies contained therein were so outlandish, each article had to be evaluated pursuant to a "Manure Meter", which measures the level of BS contained in each article. 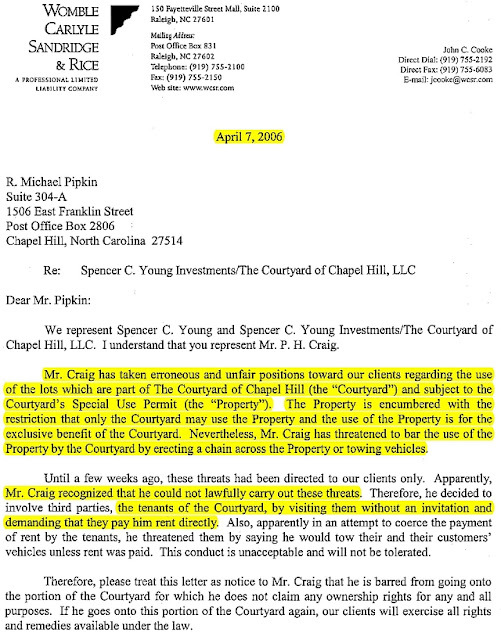 And although Mr. Craig was thwarted by the Town of Chapel Hill from erecting a blockade for 19 months, at the end of July 2007, the blockade was suddenly erected and the Town of Chapel Hill failed to enforce the "special use" parking permit requiring the subject parking spaces be exclusively dedicated for The Courtyard of Chapel Hill parking.